I began reading this book in some trepidation. Kathleen Peyton is a hero of mine. When I was eleven, and rather lost and lonely in a very big school where everybody seemed to know what they were doing except me, I was embarrassed when my Mum volunteered to run the school book stall (remember them? Whatever happened to that brilliant initiative?). On the advice of the other mother manning the stall, my mother bought me 'Flambards', even though I'd said that I really didn't want any book. But of course I loved 'Flambards', and I still do. How could I not love a book that combined a romantic gritty historical tale of being orphaned and discovering horses, and falling in love, all in an accessible, but seemingly grown-up, read? I read that book, and read it again, and read all the others in the Flmabards series. And then I looked for other books by other people, and I became a 'proper' reader. I read lots more K M Peyton books as a young adult, and later as a bookseller,and as a mother recommending them to my own daughters. KM Peyton has written an amazing book a year since she was fifteen; sixty in all! But I hadn't read any of this latest series, set in Roman Britain ... until now. 'Minna's Quest' has been a delight to read. It has all the hallmark K M Peyton attributes, chiefly a wonderfully romantic adventurous tale, set in an historical past that is lightly brought to life, and set in a vividly portrayed landscape. I know for sure that my adolescent self would have loved this book just as much as I loved 'Flambards'. This story opens with a newly born foal abandoned on a beach on the Essex Marshes, and somehow eleven-year-old Minna must save the foal before the incoming tide drowns it. 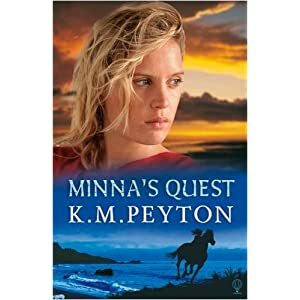 Minna herself is the classic Peyton 'firebrand' of a girl; able and brave. There's handsome Theodosius Valerian Aquila, leader and fighter with a soft spot for socially inferior Minna. Of course they will come together as the trilogy progresses! But there's bloody life-or-death action involving pirates as well as the tingles of romance and adoration of horses in this story. There is suspense and excitment of the kind that made me read the book in one sitting. And there is interest too in the depiction of the dying days of Roman Britain with its mix of races and religions finding echoes in Britain today. I nearly always find photgraphic covers showing real people hard to relate to stories because I want to create my own images of the people, or 'become' them myself, and that is somehow easier with an artistic representation. This cover shows a young woman who is decidedly older than eleven or twelve, presumably because the same model poses for the later books in which Minna becomes older. But I did so love the Victor Ambrus illustrations of those K M Peyton books I still have from my own childhood. So perhaps I'm just being sentimental?! But I highly recommend this book. Thank you yet again, Kathleen Peyton! I love this book too! In fact I love all K M Peyton's books and only wish they'd been around when I was a child. But the joy of such books is that they work their magic at any age. How I agree about the use of "photographs" of characters! She looks much older than the age you describe though maybe she'll encourage readers into the world of a wonderful story. Love KM Peyton - haven't read this one yet, so something tolook forward to. And loved Victor Ambrus' distinctive style of illustrations - can be seen at work on repeats of Time Team!